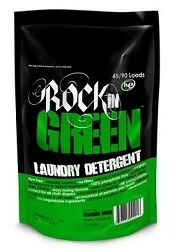 Have you won a 1.3kg bag of Rockin’ Green laundry detergent? Thank you everyone who has joined us so far over at the New Zealand Babywearing Week Facebook page. To celebrate our 300 page members we have two 1.3kg bags of Rockin’ Green Classic Rock laundry detergent to give away courtesy of Rockin’ Green New Zealand. Classic Rock by Rockin’ Green – This classic formula is great for cloth nappies and regular clothes. So use it on everything! This formula is designed for those with middle of the road water, not too soft and not too hard. When in doubt start with classic rock! Another giveaway will be happening to celebrate 400 Facebook page members with a prize donated by another New Zealand Babywearing Week sponsor – keep an eye out for details. This entry was posted in Giveaways, New Zealand Babywearing Week and tagged babywearing, cloth nappies, giveaway winners, laundry detergent, rockin' green. Bookmark the permalink.